If you’re interested in joining our choir, a great way to “test the waters” is to come and visit one of our practice sessions. We practice every Tuesday night at the Eirianfa Centre in Denbigh, from 7:30pm until 9:30pm. The Choir is more than music to us. It’s a great chance to socialise and make new friends. You do not have to be able to ‘read’ music although it is an advantage if you do so. 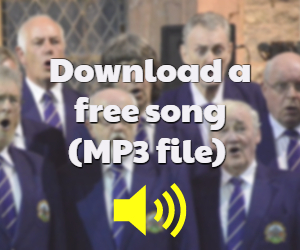 All song sheets and uniform is provided free of charge to each member. So come on down, have a listen, have a cuppa and a chat and see how it goes. We’ll make you feel very welcome. Here’s a Google Map showing where Eirianfa is, just in case you’re not sure. There’s a large public car park directly opposite, which always has spaces in the evenings.